Pierre Bonnard: Painting Arcadia exhibition at the Legion of Honor ; De Young museum and Private Collections & Homes. The Bonnard exhibition first opened at the Musée d’Orsay and travelled to the Fundacion MAPFRE in Madrid before going to San Francisco. Thanks to Sotheby’s assistance and support, we were invited to the exceptional home of a Contemporary art collector and enjoyed the welcome dinner they hosted. Esteemed art dealers John and Gretchen Berggruen welcomed us for a cocktail in their art filled home followed by the opening of a new exhibition at their gallery. 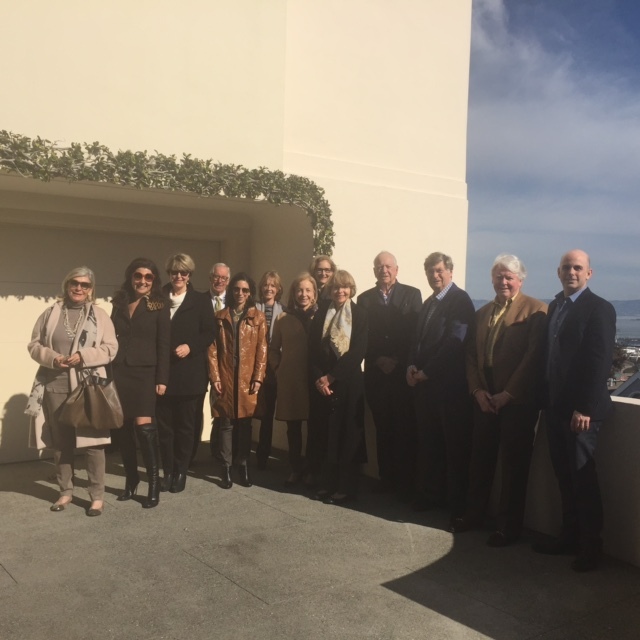 Diane B. Wilsey, President of the Fine Arts Museums of San Francisco, opened her home for tea and welcomed us at the VIP opening of the Bonnard exhibition at the Legion of Honor. Susan Solomon, Jennifer Biederbenck, Missy VanBuren-Brow, Peter Solomon, Aaron Lieber, Bruce Horten, and Greg Joye. Thank You to our members and guests for the success of this weekend and their continued support, and thank you to our generous hosts for opening their doors.